This review identifies successful approaches to collating and using biodiversity data in spatial planning and impact assessment, the barriers to obtaining and using existing data sources, and the key data gaps that hinder effective implementation. The analysis is a contribution to the EU BON project funded by the European Commission FP7 research programme, which aimed to identify and pilot new approaches to overcome gaps in biodiversity data in conservation policy at European and national levels. The consideration of biodiversity in impact assessments and spatial planning requires spatially explicit biodiversity data of various types. Where spatial plans take account of biodiversity, there are opportunities through Strategic Environmental Assessment (SEA) of development plans and Environmental Impact Assessment (EIA) of individual development proposals to ensure that consented activities are consistent with no net loss of biodiversity or even a net gain, and help to maintain or develop coherent ecological networks. However, biodiversity components of SEAs and EIAs have often been found to be of insufficient quality due to the lack of data or the inadequate use of existing data. Key obstacles to providing access to biodiversity data include the need for data standardisation and data quality governance and systems, licensing approaches to increase data access, and lack of resources to target gaps in data coverage and to develop and advertise policy-relevant data products. Existing data platforms differ in the degree to which they successfully provide a service to spatial planners and impact assessment practitioners. Some local governments, for example Somerset County Council in the UK and the Bremen federal state in Germany, have invested in integrated data collection and management systems that now provide intensively used tools for spatial planning and impact assessment informed by local data collection and monitoring. The EU BON biodiversity data portal aims to provide a platform that is an access point to datasets relevant to essential biodiversity variables on species, habitats and ecosystems. The EU BON taxonomic backbone provides an integrated search function for species and taxa according to different classifications, and also provides a range of tools for data analysis and decision-support. This will increase the accessibility of the vast range of biodiversity data available in different sources and allow the targeting of future data collection to address current gaps. This review identifies successful approaches to collating and using biodiversity data in spatial planning and impact assessment, the barriers to obtaining and using existing data sources, and the key data gaps that hinder effective implementation. It primarily targets the public authorities responsible for assessing the quality of the impact assessments and the integration of any resulting decisions into spatial planning, and the private consultants and public institutes that are providing impact assessments. For example, in the case of environmental impact assessment (EIA), the key primary data users are the consultants hired by private developers to produce EIAs, and the public planning authority responsible for reviewing the EIA and granting planning permission. The key secondary data users are the stakeholders commenting on planning applications including NGOs and private citizens. The access of public planning authorities to biodiversity data varies and the work highlights examples of good practices in data access and use, examples where data have not been used despite availability, and finally cases in which data are not currently available. The research aims to highlight the benefits of integrating biodiversity information at an early stage in development planning, and examples of systematic biodiversity data collection that informs systematic development planning. We identify strategies for data mobilization and use in conservation and show what data gaps could be filled using new tools, additional open access datasets and citizen science initiatives. The analysis is a contribution to the EU BON project funded by the European Commission FP7 research programme, which aimed to identify and pilot new approaches to overcome gaps in biodiversity data in conservation policy at European and national levels. In this review, spatial planning refers to the public process for analysing and allocating the spatial and temporal distribution of human activities across a landscape or region, including the creation of a spatial plan. Impact assessment (IA) refers to the assessment of impacts on biodiversity associated with development plans, resulting in planning decisions or prioritisations that reduce or minimise impacts on biodiversity. Spatial plans and other development plans that influence certain sectors must undergo a Strategic Environmental Assessment (SEA), which aims to ensure that environmental aspects are considered effectively in plans including the identification of alternatives and mitigation measures related to the siting of major infrastructure. Plans and programmes are also subject to an appropriate assessment (AA) *1 if they have possible impacts on the Natura 2000 Network, and if there is an AA there must also be an SEA *2 . Environmental Impact Assessment (EIA) is designed to assess the impacts of specific projects before they go ahead, and reduce or avoid environmental impacts as part of the process. An EIA may be carried out in parallel or together with an appropriate assessment if there is the possibility of a significant impact on a Natura 2000 site. Biodiversity data sources play a key role in the mapping and monitoring of species and habitats in spatial planning, and are also critical to the assessment of impacts on nature and biodiversity in SEAs, AAs and EIAs. Spatial planning can contribute to biodiversity objectives by integrating all the issues that affect the development and use of land within a specific territorial area, as well as considering strategic issues that may affect a wider area than the individual plan, including functional ecological areas. Ideally, plans should set out a clear vision for how the natural environment can be enhanced and how to ensure that social and economic development takes place within environmental limits. The approach to terrestrial spatial planning varies greatly between and within Member States. Each Member State has its own legal framework and spatial plans at national, regional and local scales. However, only a few regions in the EU currently develop large-scale terrestrial spatial plans that identify desired land uses with respect to environmental, social and economic needs, and not all Member States explicitly address biodiversity in spatial planning (i.e. identifying areas of land in spatial plans with different levels of protection/ biodiversity-friendly management in order to achieve biodiversity objectives). Where there is obligatory biodiversity compensation and offsetting, for example in Germany, spatial planning is an important tool for reserving and optimising biodiversity compensation or offset areas. Marine spatial planning is only now being established, but presents significant opportunities for large-scale systematic planning for biodiversity conservation. The Maritime Spatial Planning Directive *3 obliges coastal Member States to establish and implement maritime spatial planning (MSP) using an ecosystem-based approach to analyse and organise human activities in marine areas to achieve ecological, economic and social objectives. MSP helps public authorities and stakeholders coordinate their activity and optimise the use of the marine space to benefit both economic development and the marine environment, including nature and species conservation sites and protected areas. Maritime spatial planning differs from terrestrial planning because it operates within three dimensions: the seabed, in the water column and on the surface. MSP is generally carried out at the regional sea basin scale, but close trans-boundary cooperation and coherence must be ensured. In most Member States *4 , local or regional authorities are responsible for maritime and coastal planning up to 12 nautical miles from the shore, whilst national authorities are responsible for planning in the exclusive economic zone (EEZ). Terrestrial spatial planning should be coordinated with maritime spatial planning as land-based impacts from activities such as agriculture and urban growth are relevant to the marine environment. The INSPIRE Directive *5 requires Member States to adopt measures for the sharing of spatial datasets, including biodiversity data (i.e. species and habitat distribution) and services that enable its public authorities to gain access to these spatial datasets and services, and to exchange and use those datasets and services for the purposes of public tasks that may have an impact on the environment. The MSP Directive requires Member States to organise the use of the best available data and to decide how to share information according to the INSPIRE Directive. Spatial planning provides the spatial framework for Strategic Environmental Assessment (SEA) of development plans and Environmental Impact Assessment (EIA) of individual development proposals. SEAs can promote the integration of biodiversity concerns into spatial plans and land use plans, including identification and safeguarding of areas which are needed to meet local, national or EU biodiversity targets, both to conserve existing biodiversity, and to ensure space is available for compensatory measures. The assessment of potential cumulative impacts on biodiversity is best dealt with at the strategic planning level and at a regional or landscape scale, and therefore SEAs of plans have a major role to play in this respect, while project-level EIAs should consider cumulative impacts to the degree that it is feasible. Where spatial plans take account of biodiversity, there are opportunities through EIA to ensure that consented activities are consistent with no net loss of biodiversity or even a net gain, and help to maintain or develop coherent ecological networks. However, a lack of terrestrial regional planning in many Member States means that many SEA and EIA processes are conducted in the absence of high-level spatial policy and related guidance. 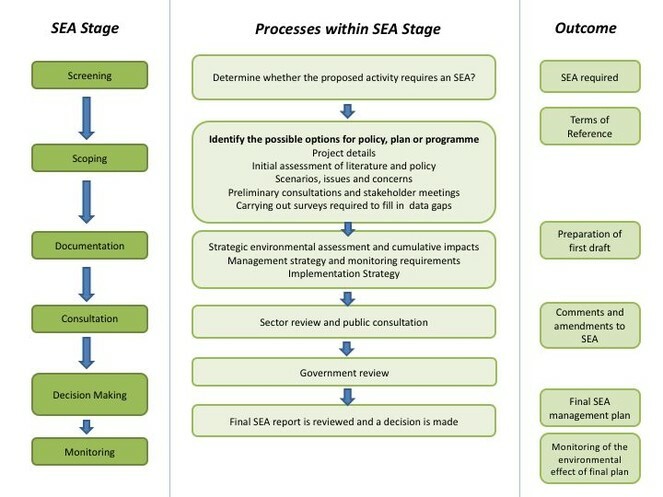 Strategic Environmental Assessment (SEA) considers plans and programmes to find alternatives that locate developments in areas that avoid significant environmental impacts as much as possible, and if necessary to identify sites where compensation or offsetting could provide valuable benefits (see Fig. 2 for the steps in the process). It is defined by the SEA Directive *6 . SEAs are mandatory for all plans and programmes which set the framework for future development consent of projects in the sectors that require an EIA. Member States should use screening procedures to determine whether SEAs are required for plans and programmes that affect land use in small areas at the local level, and for plans and programmes in other sectors. Whether spatial plans or land use plans require an SEA or not differs between Member States; four countries *7 require SEA on all land use plans, but most require SEAs on plans at regional or national level whilst local plans only require SEA on a case-by-case basis ( COWI 2009 ). Own compilation based on information in ( King et al. 2012 ). Steps in the Strategic Environmental Assessment Process. Environmental Impact Assessment (EIA) is a process designed to ensure that projects likely to have significant effects on the environment because of their nature, size or location are subject to an assessment of their environmental effects before development consent is given (see Fig. 3 for the steps in the process). EIAs are mandatory for certain types of large infrastructure or development *8 , and screening procedures should be used to determine whether EIAs are required for other projects that might have significant environmental impacts *9 . EIA legal requirements in the EU are defined by the EIA Directive *10 as amended in 2014 *11 . The revised Directive clearly states that measures should be taken to avoid prevent, reduce and if possible offset significant effects on biodiversity (with particular attention to the species and habitats protected under the Birds and Habitats Directives) *12 . Measures should contribute to avoiding any deterioration in the quality of the environment and any net loss of biodiversity in accordance with the EU Biodiversity Strategy. It also refers to the importance of ensuring a high level of protection of the marine environment by adequately taking account of technologies used in the marine environment. The developer is required to employ accredited and technically competent experts to carry out the EIA. The decision maker is responsible for ensuring that the EIA is up to date and can request more information and data if they feel the information presented by the applicant is insufficient or out of date. Steps in the Environmental Impact Assessment Process. Appropriate Assessment (AA) is designed to assess any significant negative impacts of developments on habitat types and species for which Natura 2000 sites are designated. It is mandatory for any plans or projects possibly affecting Natura 2000 sites, and must be separate from EIA or SEA. AA, SEA and EIA have unique but complementary objectives and emphasis in biodiversity impact assessment (see Table 1 ). Although the assessments must be clearly separate, the procedures may be carried out in parallel or integrated into the same overall report ( Gonzalez et al. 2012 ), and much of the information gathered in an SEA and EIA is of importance to inform an AA (e.g. hydrological, geophysical and water quality) ( Sundseth and Roth 2013 ). Comparison of main legal and procedural differences between Strategic Environmental Assessment, Environmental Impact Assessment and Appropriate Assessment (compilation based on Gonzalez et al. 2012 McCracken 2010 Royal HaskoningDHV 2012b ). Which biodiversity assets (species, habitats etc.) are present? What is their conservation importance? What is their conservation status, e.g. what are their threat status and/or long-term trend? Are there other habitats/features that provide important ecological functions (e.g. food resources and connectivity)? What protected areas and other areas of conservation concern are present? Data useful for biodiversity mapping include land cover maps, habitat and biotype distribution data, species distribution maps, location of protected areas, and other environmental data that directly relate to relevant pressures on biodiversity. Data can be presented as a map, metadata, and/or the raw data as a download. The types of biodiversity data required for spatial planning and impact assessments are listed in Table 2 . Useful information could be in the form of: maps, GIS map layers, satellite images, orthophotos, databases, statistics and trends, indicators, reports and studies. All of this information must have the correct format, structure and resolution needed for inclusion in an integrated spatial analysis. 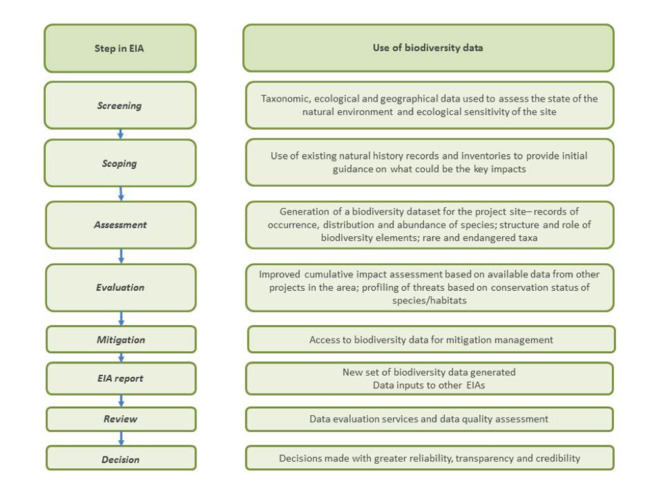 Types of biodiversity data that may be required for an Environmental Impact Assessment, Strategic Environmental Assessment, Integrated Assessment or spatial plan. An appropriate assessment should evaluate the conservation status of rare species, which may include their genetic composition, but not required for SEA or EIA. Data at the EU-level, national or regional scale are usually utilised during the screening and scoping stages within impact assessments. They are used to help planners ask fundamental questions to decide whether the impact of development will be significantly damaging for biodiversity. Wherever planning or programming and the associated SEA affect more than one country, for example transport or energy infrastructure, or planning in international marine waters or river basins, there is a requirement for data that are comparable across the different countries involved. This creates a need for data centres that provide data sets for a group of countries or at the EU level. Species occurrence data are available via the Global Biodiversity Information Facility (GBIF), European Ocean Biogeographic Information System (EurOBIS) and national portals. The European Bird Census Council (EBCC) provides European bird data including populations, abundance and trends. In Europe’s marine areas, there are initiatives that bring together data from Member States bordering the sea. For example, Member States bordering areas of the Baltic Sea have collaborated together to develop the Baltic Sea portal HELCOM. Table 3 identifies key terrestrial biodiversity data sets available at EU level, and Table 4 identifies some key marine biodiversity data sets at EU level ( EEA 2015 ). A review of data portals available in the EU can be found in the Suppl. material 1 . Terrestrial biodiversity data sets and related environmental data sets at the EU level (see Suppl. material 1 for further information and links to sources). Annual bird population trends from a range of survey designs, summarizable to larger common spatial scales. Data are heavily skewed to a few countries who upload the majority of the records. Accessible online under European public access rules; restrictions to data accessibility for UK and Greece. Complete dataset from 2006, partial dataset from 2012. Annual data on butterfly numbers from various national surveys, summarizable to larger common spatial scales. Periodic surveys of land cover and land use: 1) systematic sample of land cover points; 2) stratified sample of field characteristics measured in field visits. Marine biodiversity data sets and related environmental data sets at the EU level. (see Suppl. material 1 for further information and links to sources). Species occurrence (phytoplankton, zooplankton, angiosperms, macro-algae, invertebrate bottom fauna, birds, mammals, reptiles and fish). Distribution grid maps and point data; downloads in various formats. Spatial resolution varies. Open access bound by EMODnet terms and conditions; data are accessable via the EMODnet and LIFEWATCH websites. Online database of expert summaries for non-commercial purposes subject to IUCN conditions of use; range maps can be downloaded by registered experts. Predictive seabed habitat map with associated confidence maps (high, medium, low). Access online or via data request form according to ICES data policy. Downloadable as maps, charts and tables subject to specific exclusions to unrestricted public access, as data may have been provided by non-governmental organisations. Some Member States have developed national portals to aid policy makers and consultants with spatial planning, EIA and SEA. For example, the Danish Natural Environment Portal and the UK MAGIC portal provide access to large collections of data sets on biodiversity and the environment (see Suppl. material 1 for descriptions). Some local authorities have started to develop data portals and tools to facilitate local spatial planning and EIA. The EIA process assembles a biodiversity dataset for a specific project site. 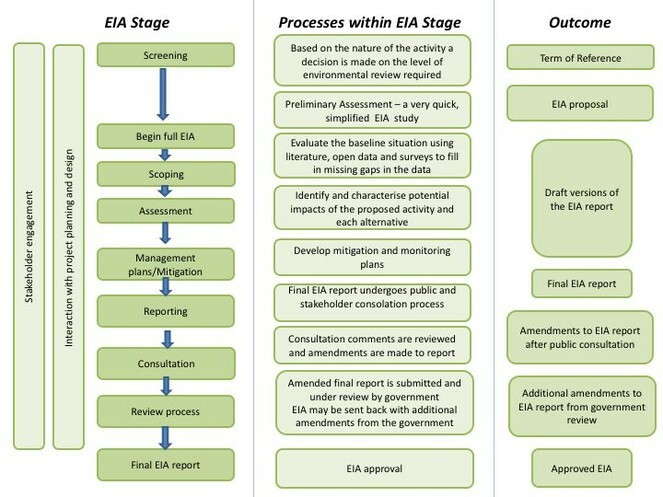 Different kinds of data are used at each step in the EIA process, as illustrated in Fig. 1 . With these data, negative impacts on species and habitats from potential development activity within an area can be identified, the cumulative effect on biodiversity can be mitigated, and adaptive management plans can be produced to protect biodiversity. EIAs involve detailed surveys of the relatively small area directly affected by the project or development. Published and available data are usually not at such a fine scale and/or are not up to date, and so require the consultant to carry out field surveys, analyse aerial photos, and assemble environmental data. For marine datasets, consultants are more likely to be paying for survey data. The processes of spatial planning, SEA and EIA are closely connected and are designed to inform one another. Spatial plans can provide a holistic approach addressing social, economic, and environmental objectives to help to achieve sustainable development. If the best available information is used, spatial plans can reduce conflicts between industrial sectors and the environment and can also reduce the risk of development activities damaging ecosystems through an improvement in the consideration of cumulative effects. The spatial planning process allows for more informed and rational selection of development sites and for more efficient use of space and resources ( Gilliland and Laffoley 2008 ). In an ideal scenario, spatial plans provide the environmental baseline and framework for SEAs of spatial developments such as transport plans, and EIAs for projects and developments. Spatial plans must themselves be subject to an SEA. However, spatial plans based on poor and limited biodiversity data will hinder the scope of SEAs and EIAs, and can lead to reduced or aborted projects with potentially major economic impacts on developers. An example of this, as documented in the evaluation study supporting the Fitness Check of the birds and habitats directives ( Milieu et al. 2016 ), was the SEA carried out for the London Array Wind Farm in the UK. This was granted a license by The Crown Estate and was planned to consist of 341 turbines of 1GW capacity. However, surveys identified up to 6,500 wintering Red-throated Diver (Gavia stellata) in the north-east area of the licensed area, the most important such habitat in English waters (and in excess of the total available estimate of the wintering population of the species at that time). Inadequate marine surveying prior to licensing meant that this major concentration of wintering birds had not been identified. Although it had been subject to SEA, the available data to populate it was so limited as to render the exercise almost meaningless. Thus the licensed site included a significant area of high ecological value, which was only subsequently revealed by developer-led surveys. Negotiations between the developer and the statutory nature conservation authority and the Royal Society for the Protection of Birds (nature conservation NGO), led to the site being considered as though it were a Special Protection Area (SPA) (i.e. a Natura 2000 site), given its high interest. The scheme was reduced to two-thirds its original planned size, and implementation took place in two phases, ensuring no adverse effect on the integrity of the SPA. SEAs and EIAs are often found to be of insufficient quality because of the limited access to environmental data, including biodiversity data, and/or inadequate use of existing data ( COWI 2009 ). Two surveys of EIA and SEA practitioners across the EU in 2009 found that they faced problems in using spatial data for the preparation of environmental reports, mainly related to finding and accessing data of the quality needed for the purpose, which increased the cost and time needed to carry out the assessments ( COWI 2009 Craglia et al. 2010 ). There is considerable variation in the level of detail describing the baseline situation; and whilst many SEA reports did contain detailed data and information, this was not fully taken into account in the strategic analysis of possible impacts and solutions ( COWI 2009 ). Practitioners also mentioned critical problems with identifying the right scale and level of detail for biodiversity information, as plans differ in their precision of definition of possible impacts (e.g. regional plans may not precisely define the route of possible new roads). Public authorities face challenges in assuring the quality of the data submitted in EIA reports. An earlier questionnaire survey in 2005 of 36 organisations revealed that almost all the organisations (90%) making use of spatial data experience problems with the availability, quality and use of spatial data for preparation of EIA and SEA reports ( Vanderhaegen and Muro 2005 ). Most respondents identified problems with the accessibility of existing data (70%), followed by difficulties with finding out which data are available (56%) and the unavailability of the data needed (51%). Other important obstacles described by the users of spatial data are the incompatibility between datasets from different suppliers (47%) and the insufficient quality of the existing data (47%). Roughly 44% of the respondents reported difficulties in obtaining national data due to costs and licensing agreements and another 44% of them consider that important information is missing in the existing data. The lack of biodiversity data may result in weaker protection and poorer quality of mitigation than could otherwise be achieved. A review of ecological impact assessments in England from the year 2000 found that although the EIAs often resulted in the implementation of habitat mitigation measures, these were often based on a weak information base and consequently had a low effectiveness ( Drayson and Thompson 2013 ). A more recent English review concluded that ‘many local planning authorities do not currently have either the capacity and/or the competence to undertake the effective, and in some cases necessarily lawful, assessment of planning applications where biodiversity is a material consideration’ ( Oxford 2013 ). A study in Finland ( Söderman and Saarela 2010 ) questioned government authorities from the regional environment centres, planners and consultants about the integration of ecology within SEAs of municipal spatial plans. In Finland, regional land use plans are developed in negotiation between authorities and the regional environment centre(s). Local land use plans must take account of the regional plan, but are drafted by municipalities and approved by the local municipal councils without ratification by the environmental authorities, which have only a supporting and guiding role. The study found that the municipal planners rely heavily on the expertise of the consultants and their ecological data and interpretation of the data. The planners had an overall positive opinion of the use of ecological studies, data and recommendations in planning, and most value the digital map produced by the SEA, which represents the essential results in a GIS form that can be directly utilized in planning. The regional environment authorities thought that the SEA recommendations do influence planning developments, but that the protection of specific habitats and species is not sufficient. The authorities and the consultants considered that ecological connections are not treated thoroughly in SEAs, partly due to data availability and partly due to the focus on species inventories without consideration of the ecosystem level. The municipal planners also wanted more consideration of larger ecological units. The study concludes that sufficient resources must be invested for collaboration and interaction in the scoping phase (preparation of assessment and public participation) including discussions on the baseline study and assessment area, biodiversity elements to be assessed and methods to carry them out. Appropriate assessments for developments in Natura 2000 sites require an additional depth of information on the habitats and species of European conservation concern present in the site. A review of EIA and AA of port development projects in European estuaries ( Royal HaskoningDHV 2012a ) recommended that a long term forum including developers, stakeholders and regulatory authorities is needed to implement changes on the basis of the data produced from monitoring programmes. A review of biodiversity data and information in the Mediterranean region found a notable deficit of data on marine and terrestrial ecosystems and habitats and pressures on these ecosystems from human development ( IUCN et al. 2015 ). Although several monitoring initiatives were launched during the last ten years, in particular to monitor the populations and habitats of endangered species (monk seal, turtles, some marine bird species, Posidonia meadows, etc. ), concerns were raised about poor levels of terrestrial and marine monitoring outside protected areas. The INSPIRE Directive has instigated efforts to coordinate and increase public access to spatial data and coordinate data use across governments, and a number of national and regional geo-portals now provide public access (under different types of license agreements) to many datasets and services that go beyond INSPIRE requirements ( EEA and JRC 2014 ). The INSPIRE technical guidance on species distribution data includes rules to ensure that absences of data are clearly identified, taxonomy follows EU-NOMEN or EUNIS, and metadata are clearly defined *13 . The INSPIRE technical guidance on habitats & biotopes defines data specification requirements that will allow the combination of spatial data and services from different sources across the European Community in a consistent way without involving specific efforts of humans or machines *14 . The specifications include spatial and temporal schema (knowledge about the spatial data set content at a specific time and knowledge about changes to a data set in a specific time frame), unique identifier management, spatial object types (point sets, curve sets or grids) and object referencing, and common code lists. Habitats or biotopes should be classified according to the EUNIS habitat classification as well as other compatible and recognised classifications (such as the Habitats Directive Annex I habitat types). If all the data that quantifies the habitats and species present in a defined local area is collated and available in a GIS system (and regularly updated), it can be used by local planning authorities to inform spatial planning ( POST 2015 ). The Somerset Country Council Integrated Habitat System in the UK is a good example of this. Somerset Council in collaboration with the local Environmental Records Centre have developed a digital mapping system which shows the likely distribution and habitat use of the most important species in Somerset. It contains translation tools between the UK habitat classifications (British National Vegetation Classification (NVC), Phase I, UK Priority Habitats) and the Habitats Directive Annex I habitat types, and between field survey data, aerial photography and GIS data ( Somerset Wildlife Trust 2016 ). The datasets are therefore fully compatible. Planners can access data of varying scales of detail based on their needs and produce maps that are based on a sound analysis of the available information. The Somerset Integrated Habitat System is a key tool for planning officers and consultants carrying out EIAs and for the Council’s Ecology Officer for SEA and appropriate assessment of local spatial plans. The system is part of the Somerset County Council’s species-focused metric which was initially developed for use in appropriate assessment and compensation under the EU Habitats and Birds Directives but is now included in Somerset’s biodiversity offsetting methodology and used in all relevant planning applications ( Somerset County Council, 2014 ). The Shetland Islands’ Marine Spatial Plan (SMSP) ( Shucksmith et al. 2014 ) is a good practice example of data use for marine spatial planning. It was one of the approaches to regional marine planning piloted within the Scottish Sustainable Marine Environment Initiative (SSMEI) set up by the Scottish Government in 2006, via Marine Scotland, as part of the preparation of coordinated marine spatial planning in Scotland. The plan was created in an iterative process of mapping environmental and socioeconomic features into GIS format, including important marine and coastal attributes and ecosystem services. Stakeholders were consulted to inform the creation of the local evidence base. This was followed by a formal public consultation. Two subgroups were created to oversee the collation of biodiversity and spatial analysis data, respectively, and were responsible for assessing data quality and extent. The available data sources were examined and gaps were identified, guiding the collection of new data. As a complete seabed survey of the entire area was not feasible, a predictive biotope map was produced and verified by testing at selected sites. The initial data collection process took 18 months. A review of the SMSP indicated that developers and policy-makers were using its data and policies to inform the planning and assessing of development proposals. The inclusion of local knowledge allowed the refinement of datasets to improve quality. It is becoming increasingly feasible in terrestrial areas to use remote sensing data for the monitoring of the Natura 2000 network and to inform of developments that might require appropriate assessment ( Blonda et al. 2013 ). If EU Member States can regularly acquire high resolution and very high resolution earth observation imagery on their Natura 2000 sites, they can set up change detection systems to monitor illegal developments, and quantify trends in the distribution and status of habitats ( Ruf and Kleeschulte 2016 ) *15 . They can also monitor the direct surroundings of Natura 2000 sites to detect influences on the quality of the habitats present in the Natura 2000 sites. Methods and a semantic framework have been developed to translate land cover data to habitat maps ( Blonda et al. 2013 ). LIDAR *16 data are very useful for the accurate assessment of vegetation structure, such as plant height, which is key to determining the spatial distribution of flora and fauna and which cannot be derived directly from optical data. However, LIDAR data are not currently readily available in many Mediterranean countries. Also, it is important to note that the feasibility (particularly for satellite-based earth observation technology) is still limited in the marine area beyond the coastal zone, and challenging even there *26 . The European CORINE land cover classification system is currently not suitable for measuring semi-natural habitats of conservation value. The European Environmental Information and Observation Network (EIONET) expert Group on Land Monitoring in Europe (EAGLE) has developed enhanced class definitions for the CORINE land cover classification, which should provide a more consistent harmonized CLC map production (both with traditional photo-interpretation and bottom-up/semi-automated methods), and a way to break down land cover class description to land cover, land use and characteristic landscape components ( Blonda et al. 2013 ). Biodiversity information obtained during EIAs is rarely accessible for other uses following the completion of the EIA. Reasons include the fact that the primary biodiversity data collected during EIAs are typically gathered as a ‘one off’ and vary greatly in precision, accuracy and type; the data are rarely captured in forms and formats that make them accessible and re-usable, and so are inaccessible after the completion of the EIA ( King et al. 2012 ). EIA consultants do not prioritise the long-term management, archiving and publishing of data generated during the EIA process, and there is no culture of data management and dissemination in EIA practice. Although SEA and EIA reports are publically available, data used to make comments and assumptions may not be publically accessible and require licences and/or fees to access. It is often difficult for stakeholders, such as citizens or nature conservation interest groups, to access and combine biodiversity information with information on spatial planning and development proposals. Respondents to a survey of organisations involved in wetland conservation in the Mediterranean region in 2011 ( MWO 2011 ) found that a third of the institutions surveyed were part of a formal and open network of data collection and access. A third belong to a restricted network in which data are supplied on request and the remaining third have not developed nor belong to a data collection and access network ( MWO 2011 ). In contrast, most of the national NGOs in the Mediterranean have developed internal open systems for accessing and sharing data. The UK government has committed to enabling open access to as much marine data as possible *17 . The aggregates, oil and gas, cable and ports industries all collect a vast amount of data that have the potential to inform policy requirements. The offshore renewable energy sector already supplies data to the Crown Estate (which manages UK marine property rights) according to a data clause written into licensing agreements and following the data guidelines, and this is made publicly available (subject to commercial confidentiality) *18 . A review of attitudes to data sharing in UK marine industries found that data collectors were generally positive about sharing and allowing the re-use of their marine environmental data ( ABPmer 2015 ). However the review also identified a number of barriers which currently prevent industries from sharing data, including the commercial confidentiality of certain datasets, industry concerns about how data will be used, and the time and cost required to adapt data formats to make them useful to other users, as the marine industry operates to standards that are different from those used by the government data platforms *19 . The review found that the industry lacks knowledge about the data platform infrastructures. It also concluded that industries are only weakly motivated to supply data, as they do not perceive any direct benefits of doing so. Problems with access to government-held data on habitats and species distributions occur in some Eastern European countries. In Bulgaria, government data on habitat and species distribution and monitoring is not made available by the Ministry of Environment. The Bulgarian Biodiversity Foundation (BBF) has therefore developed a web-based GIS platform that provides public access to spatial plans, with locations of protected areas (including Natura 2000) and other information on species and habitats in Bulgaria *20 . The aim is to increase the capacity of Bulgarian citizens and NGOs to monitor development projects and EIAs and advocate for nature protection. Sustainable solutions to the co-existence of resource exploiting activities with nature conservation are often only possible when the best possible data are available to all stakeholders involved and a consensus can be reached. For example, in the Welsh part of the Irish Sea, a method was developed for assessing the sensitivity of different seabed habitats to existing fishing activities, across a range of potential fishing intensities ( Eno et al. 2013 ). The map uses the highest resolution of sea-floor habitat mapping available and combines this with scores of sensitivity to fishing gear for each habitat. Sensitivity was scored based on a combination of the resistance of a habitat to damage and its subsequent rate of recovery, based on scientific literature, with expert judgement used to extrapolate results to habitat and gear combinations not directly examined in the published literature. The resulting sensitivity matrices were then subject to further peer review at a series of workshops. Fishing associations were involved in the design and testing of the maps. An EIA biodiversity data publishing framework, based on the Global Biodiversity Information Facility (GBIF) global standards, has been proposed to make EIA biodiversity data available and exchangeable using globally accepted standards ( GBIF 2011 King et al. 2012 ). The suite of standards and data publishing tools can be used to capture, publish and discover primary biodiversity data in standardised formats. Numerous platforms at the EU level and in Member States offer access to biodiversity data and information relevant to spatial planning and impact assessment. The policy requirement for maritime spatial planning has stimulated the development of GIS systems that integrate environmental and biodiversity data on marine and coastal habitats and ecosystems ( Meiner 2010 ). The European Commission is funding the development of tools to assist with terrestrial and marine spatial planning. These include the European Marine Observation and Data Network (EMODnet), the European Atlas of the Seas, and the Copernicus programme (also known as Global Monitoring for Environment and Security GMES). Data portals differ greatly in the scope and content of the biodiversity data they provide, but also in the degree to which they successfully provide a service to spatial planners and impact assessment practitioners. The Suppl. material 1 contains more information on the EU and Member State level biodiversity data platforms reviewed in this study. Key obstacles identified from the literature and from interviews with portal developers are summarised below. Biodiversity portals aim to source data from a variety of sources including conservation organisations, scientific research bodies and some data from citizen science projects. Standardizing the data, such as in relation to species nomenclature, is a challenge for portal developers. The EMODnet portal has addressed the challenge of managing marine biodiversity data by investing in the development of a global taxonomic standard (World Register of Marine Species) and by using the IOC-OBIS community to discuss and define standards in biodiversity management. The marine data and metadata on the portal conform to the INSPIRE Directive requirements and to the standards set by the SeaDataNet, WoRMS, OBIS (Ocean Biogeographic Information System), GBIF and LifeWatch systems. These data are applicable mainly to species at the moment, with less relevance for habitats (although the classification systems for habitats in Europe are better established than those available globally). All the portals produce guidelines on how data should be presented and data quality requirements. Data quality control systems with regular data checks and updates are required as some incoming data will still have errors. Data quality control is dependent on the degree of interest at national level, the resources available to institutions involved in data collection and their desire to ensure high-quality collection and management approaches, and the systems through which civil society and the public sector contribute data. A review of biodiversity data providers within the Mediterranean region ( IUCN et al. 2015 ) found that communication and feedback on data monitoring was low in many countries of the region. Most data collection involved little feedback from data compilers to data collectors. This results in a lack of motivation for data collectors to continue collection or improve collection methods. The HELCOM portal action plan includes the production of guidelines to the data standards in use and an inventory of data tools ( HELCOM 2015 ). Having consistent time frames across available data is very important. Without this, it is very difficult to assess change over time, to develop natural capital accounts, and/or to see whether the species/habitat of conservation importance occur within the area of interest. Recommended practice is to establish a suitable length of time for future updates, but identifying and implementing appropriate time cycles for updating data to suit the demands and needs of different use cases can be challenging. Different datasets will vary in terms of the time period after which they are deemed to be out of date, but resource availability issues are a limitation to maintaining a suitable updating regime. There are also issues when collating information, particularly when that information is updated regularly by the data owner - how do you ensure the data hosted in the local GIS system are regularly updated to match the data owner's version? All the EU and national biodiversity data portals have spatial and temporal gaps in coverage, due to a combination of reasons including lack of information, lack of access to available datasets, and lack of data sharing arrangements. For example, the UK holds one of the most comprehensive sets of habitat and species information. The UK government MAGIC data platform holds a large number of datasets of which over half are available under open access. However, other data may require specific licences to be published and shared, preventing the upload of the entirety of the data held by portal developers. If data do not meet the portal requirements they will not be uploaded, which may lead to gaps in data coverage *21 . Furthermore, new data layers are only added to the portal if they are deemed business-critical, due to funding cuts that have limited the budget *22 . Greater availability and synchronisation of information on the data types held by each portal is needed to prevent replication of data across portals and to provide target audiences with accurate information on the vast range of open data accessible at both national and EU level. For example, the EMODnet portal has limited data coverage of the Mediterranean Sea, particularly benthic data *23 . Data may not be present on the portal due to no research and data collection taking place within a particular region or because the portal has not yet established contact with a researcher or research body that can provide data. Certain species may be lacking in data due to identification difficulties and/or secretive behaviour patterns, which can impede reliable surveying and monitoring *23 . This particularly applies to non-commercial species and many invertebrates in the marine realm. In well-studied waters such as the North Sea there are many sources of relevant data for the SEA and EIA processes. However, many of these datasets contain gaps, are currently inaccessible or are not presented in a usable format ( Gilliland and Laffoley 2008 ). The European Commission carried out a public consultation on the EMODnet and GMES data platforms ( European Commission 2013a ). The consultation identified that restrictions to availability and interoperability of data are a barrier to further development of the platform, as obtaining data which is owned by different institutions is challenging. Many of the data are neither accessible nor interoperable. There are also costs associated with data fragmentation and inaccessibility. The consultation of EMODnet and GMES users revealed the need for long-term stable funding to continue the management of these platforms. The consultees, of whom 60% were from civil society, private companies, public authority or a research organisation, and individuals, expressed a demand for all data to be open-access, including private data. There was also a general consensus that licensed offshore sectors should be obliged to provide data. However, many respondents agreed that the vetoing of the release of private data for an agreed period of time was acceptable. The scale at which data are provided to the portals is not always at the threshold required for sufficiently detailed evaluations of species and habitats in a particular area, as reported as a concern by users of the EMODnet and MAGIC platforms *22 *23 . Data portals and information systems have the potential to facilitate the work of a diverse set of stakeholders, including spatial planners, environmental consultants, NGOs and decision-makers, as well as land owners, estate agents and local authorities. Several of the portals reviewed in this study undertake regular surveys to establish the identities of their users and their data needs. Detailed information is available in the Suppl. material 1 . The identity of portal users varies across portals. In the case of the Danish Nature Portal, the top users were identified as staff from the municipalities, regional and national government, and consultants employed by government *24 . In addition real estate agents, farmers, environmental NGOs and private citizens make extensive use of the portal services. Surveys of the UK MAGIC portal user base in 2009 and 2014 found that environmental consultants accounted for 36% of portal users *22 . In contrast, the EMODnet portal surveyed a sample of the identified purposes of data downloads, and found that 76% were for research or data exploration, whilst only a small fraction were for management and planning *23 . A survey of users of the UK government MAGIC portal found that the most commonly used datasets were the terrestrial datasets on protected areas, followed by habitat and species layers, whilst marine data accounted for less than 5% of data use *22 . This may be because there is a relatively long history of terrestrial data recording and utilisation, whereas marine datasets are more limited in comparison. Understanding the identities of portal users could allow the development of task suites or service views which are designed specifially for different use cases, such as spatial planning or policy. This would improve the accessibility of portals and increase user engagement. To encourage wider usage, portal design must allow the user to easily identify and access the data they require for their needs, and then quickly browse all the additional ‘nice to have’ data, as recommended by a plan for a Baltic Sea data exchange structure ( Wichorowski et al. 2011 ). It is therefore useful to have the data arranged in a logical hierarchy, which takes account of importance or relevance. For example, the EMODnet portal enables searching by theme, such as fish or algae. Species can be queried on both scientific and common names and plotted in an integrated map viewer allowing the researcher to combine various layers with the species dataset. Search results will also provide links to download the dataset and will identify whether the taxon is on the World Register of Marine Species (WoRMS). Influencing biodiversity policy making requires the timely communication of biodiversity results and analysis at national and local levels. In the majority of portals reviewed in this study, the available data are not easily interpretable by non-expert audiences, and require further interpretation with other contextual information in order to provide policy-relevant information. An appropriate governance structure is needed to decide what data should be collected and how they should be assembled, and the process must be administered, e.g. through the work of a secretariat. For example, a review of monitoring for the Marine Strategic Framework Directive concluded that using the same datasets for different indicators and descriptors would increase efficiency, and coordinated investments in new monitoring approaches (such as remote sensing, underwater video survey and Continuous Plankton Recorders) would fill data gaps ( Zampoukas et al. 2012 ). A review of biodiversity data and information in the Mediterranean region found poor integration between the data collecting organisations and the central data collators in public authorities ( IUCN et al. 2015 ). Almost none of the monitoring systems allowed the performance of correlation analyses between them, particularly in the countries outside the European Union legal framework. The majority of the data collected remains in computers without much examination beyond the immediate requirements of the national conservation network (e.g. monitoring of protected areas). In the German federal state of Bremen, biodiversity monitoring has been carried out since 2004 in an integrated programme which sets uniform standards and guidelines for sampling and monitoring. The data are combined in a single GIS managed by a private company created for the purpose with financing and supervision by the Bremen nature authority ( Handke et al. 2010 ). The German impact regulation demands a high frequency of species and habitat impact assessments and surveys to measure the impacts of developments and plan corresponding compensation areas that recreate or conserve lost habitats and environmental functions. A significant source of funding for the data portal comes from the private companies or local authorities who are obliged to pay for audits of their compensation areas created or designated under the regulation. The monitoring also informs protected area planning and management (Natura 2000 and other categories), reporting of the status of species of EU conservation concern protected by the EU Habitats Directive, spatial planning and compensation, EIAs, and agri-environment targeting and monitoring. The Mediterranean Biodiversity Protection Platform (to be launched in 2018) is actively involving a range of partners to ensure efficient networking, communication and provision of data, including representatives of suitable technical, institutional and financial organisations *1, 27 . The platform is designed to achieve high user engagement by providing added value to existing instruments and avoiding the duplication of activities and products ( IUCN et al. 2015 ). It is being designed in accordance with the findings of a preparatory study ( IUCN et al. 2015 ) and the recommendations of the Mediterranean biodiversity protection community who participated in the PANACeA project to channel common efforts towards an effective protection of natural resources in the Mediterranean *25 . One approach to dissemination and outreach is that of the MAGIC platform (UK), which utilises online social networks such as LinkedIn to promote the platform, and demonstrate the services offered to prospective users such as environmental consultants, in terms of planning and developing EIA, SEA and appropriate assessments *22 . However, the number of users per day appeared relatively low in comparison to the total number of potential users, varying with peaks of 1,000-3,000 per day, indicating that awareness of the existence of the portal and services amongst users is still relatively low. The effective use of biodiversity data to inform spatial planning and environmental impact assessment depends upon the availability of relevant, accurate and geographically appropriate data. In many cases, such data are lacking, which restricts the quality of decision-making. Ideally, the development of spatial plans should include a data-gathering component, and mapping efforts should focus on identifying biological elements of particular ecological significance. The consideration of biodiversity in impact assessments and spatial planning requires spatially explicit biodiversity data of various types. Where spatial plans take account of biodiversity, there are opportunities through Strategic Environmental Assessment (SEA) of development plans and Environmental Impact Assessment (EIA) of individual development proposals to ensure that consented activities are consistent with no net loss of biodiversity or even a net gain, and help to maintain or develop coherent ecological networks. However, biodiversity components of SEAs and EIAs have often been found to be of insufficient quality due to the lack of data or the inadequate use of existing data. The INSPIRE directive has not yet increased the sharing and interoperability of biodiversity data and most biodiversity data sources are not yet INSPIRE compliant. Numerous platforms at the EU level and in Member States offer access to biodiversity data and information relevant to spatial planning and impact assessment, but differ in the degree to which they successfully provide a service to spatial planners and impact assessment practitioners. Key obstacles include the need for data standardisation and data quality governance and systems, and lack of resources to target gaps in data coverage, and to develop and advertise policy-relevant data products. Some local governments, for example Somerset County Council in the UK and the Bremen federal state in Germany, have invested in integrated data collection and management systems that now provide intensively used tools for spatial planning and impact assessment informed by local data collection and monitoring. The EU BON biodiversity data portal aims to provide a platform that is an access point to datasets relevant to essential biodiversity variables on species, habitats and ecosystems. The EU BON taxonomic backbone provides an integrated search function for species and taxa classified according to different pan-European species directories, including Euro+Med Plantbase, Fauna Europaea, European Register of Marine Species (ERMS), Index Fungorum, the Catalogue of Life (CoL), the World Register of Marine Species (WoRMS), the GBIF Checklist Bank and the Plazi TreatmentBank. The backbone maps these against the European species and habitats database EUNIS. The portal also provides a range of tools for data analysis and decision-support. This will increase the accessibility of the vast range of biodiversity data available in different sources and allow the targeting of future data collection to address current gaps. Identifying and collating all the data available at national and European level could benefit policy implementers and practitioners by reducing the time and effort needed to source data from fragmented sources. The portal development process should seek to involve key stakeholders, to ensure that it satisfies their requirements, focussing on priority areas for biodiversity data based on the recommendations from stakeholders involved in biodiversity conservation and management. Communication will be fundamental for coordination between the various national data holders. In addition, routes to improving data availability and collation could be identified through actions such as the organisation of an annual meeting to bring together experts from across the Member States. Developing EU guidelines for the provision of data and its upkeep would facilitate interoperability. A key factor in the success of data portals is ensuring adequate publicity of its capabilities. The availability of funding is a key limiting factor to biodiversity monitoring and data mobilisation. The future of biodiversity data collection may depend increasingly on citizen science if funding cuts to research institutions continue. Data collected by citizen scientists can be used for biodiversity monitoring and indicators if there is a clear direction as to what data are required, to prevent the generation of large volumes of data with little structure and representation ( Gardenfors et al. 2014 ). Appropriate guidelines will allow these data to be used to address specific objectives for conservation and planning. In addition, guidance will need to be provided on systematic techniques for the collection and uploading of data. Data collectors must have expertise in species identification and, if necessary, provided with the training and necessary tools to aid this process. Restrictions to availability and interoperability of data are a barrier to expansion of data platforms, as obtaining data that are owned by different institutions is challenging. Although open access is the preferred approach, options such as licences and permits for specific data uses can persuade data owners to share data where they have concerns about their lack of control over the uses to which the data are put. facilitate the public availability of biodiversity data and studies currently kept within the private sector, NGOs, universities etc. Lauren Weatherdon of UNEP-WCMC kindly reviewed the final manuscript and provided useful comments. This paper was supported by the EU BON project which is a European Union’s Seventh Framework Programme for Research and Technical Development under grant agreement No 308454. EIA, SEA and AA, present position. Where are we now? Ecological capacity and competence in English planning authorities - What is needed to deliver statutory obligations for biodiversity? Biodiversity data sources at the EU level comprise the biodiversity and landuse-related EU reporting and monitoring programmes, and global or regional data portals which include data from European countries. Also gives an overview of spatial planning and data sources for biodiversity impact assessment in a selection of EU Member States: UK, Bulgaria, Netherlands, Germany, Sweden, Denmark and the Baltic Sea. The EU Habitats Directive (Council Directive 92/43/EEC) Article 6(3) requires plans or projects which are likely to have a significant effect on a Natura 2000 site to undergo an ‘appropriate assessment’ (AA) and should be approved only after it is ascertained that they will not adversely affect the integrity of the site concerned. Article 6(4) includes provisions that allow projects or plans that may have adverse impacts to go ahead if they are of overriding public interest and there are no alternative solutions. In such cases the Member State ‘shall take all compensatory measures necessary to ensure that the overall coherence of the Natura 2000 Network is protected’. Article 3(2) (b) of the EU SEA Directive (Directive 2001/42/EC) states that ‘plans and programmes which, in view of the likely effect on sites, have been determined to require an assessment pursuant to Article 6 or 7 of [the Habitats Directive]’ are subject to compulsory SEA. For example, England is an exception, as the Marine Management Organisation (MMO) has been delegated responsibility for all coastal and maritime planning. Directive 2001/42/EC of the European Parliament and of the Council of 27 June 2001 on the assessment of the effects of certain plans and programmes on the environment. Official Journal of the European Union L197, /30, 21.7.2001. Directive 2014/52/EU of the European Parliament and of the Council of 16 April 2014 amending Directive 2011/92/EU on the assessment of the effects of certain public and private projects on the environment Text with EEA relevance. Official Journal of the European Union L 124, 1, 25.4.2014. Member States are therefore in the process of updating their EIA regulations and guidance. They have to amend their national and regional legislation in order to comply with the new rules by 16 May 2017 at the latest. Article 3.1(b) in Directive 2014/52/EU. It is important to note that not all Habitats Directive Annex I habitat types are detectable using remote observation imagery, and a certain amount of ground truthing is required for all habitats. Light Detection and Ranging (LIDAR) is an airborne mapping technique, which uses a laser to measure the distance between the aircraft and the ground, allowing highly detailed terrain models to be generated at spatial resolutions of between 25cm and 2 metres.